The 6/8 superior in Benidorm has 4 bedrooms and capacity for 8 persons. 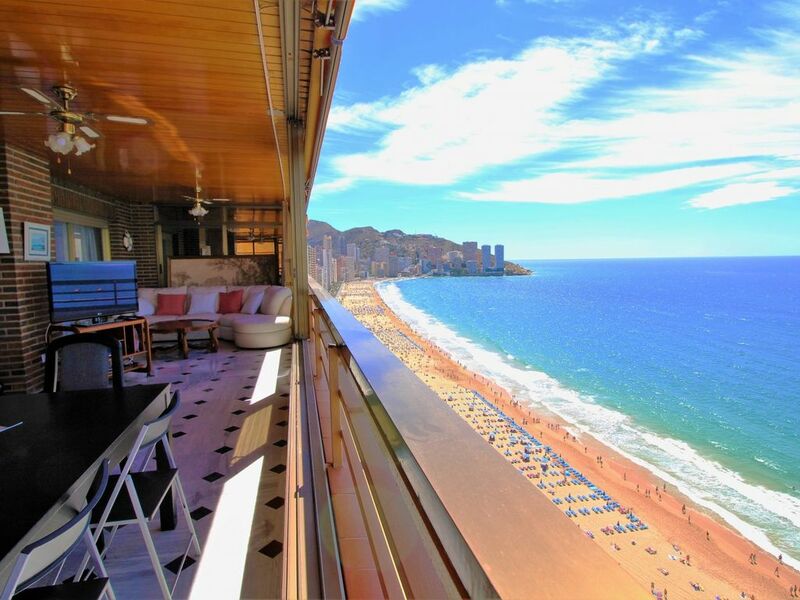 Accommodation of 253 m² comfortable and is spacious, located in beach, It has views to the sea and to the mountain. The accommodation is equipped with the following things: elevator, garden, garden furniture, fenced plot, terrace, iron, internet, hair dryer, air conditioning (heat/cold), air conditioning, swimming pool communal+infantile, garage in the same building, tv. The independent kitchen, of vitroceramic, is equipped with refrigerator, microwave, oven, freezer, washing machine, dishwasher, dishes/cutlery, kitchen utensils, coffee machine, toaster, kettle and juicer. It is located 5 m "Levante", 2 km "Cala del Tio Ximo", 15 km golf course "Las Rejas", 20 m supermarket "SuperCor", 55 km airport "El Altet Alicante", 3 km train station "Benidorm", 15 m bus station "Parada Local", 2 km skiing resort "Cable Ski Acuático", 12 km amusement park / theme park "Terra Mitica", 3 km water park "Aqualandia", 15 km "Pantano de La Vila", 20 km "El Algar", 30 km "Puig Campana" and it is located in a a charming zone and next to the sea. Geweldig appartement, zeer ruim en mooi zoals omschrijving. Zeer ruime woning op geweldige plek. Foto's zijn exact zoals de woning is. Zeer ruim en zeker een aanrader. Wij hebben met zeven personen genoten. Het terras is geweldig groot en heerlijk om van de opkomende zon te genieten. Zou er zeker graag nog een keer verblijven ... Wonderfull appartement, looks exactly like in pictures. Very nice view. Terras is very nice to enjoy the sunrise. Love to go again. Glad to read that. Come back whenever you want please.